Here with some people from Ratebeer on a pre-event pub crawl. Mauldons - Mid-Summer Gold 4.00 Gold, lasting white head. It’s an ok golden ale, some citrus, bit stale. OK hop. 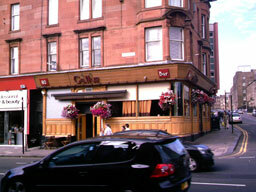 The pub is found in Glasgow, Glasgow, City of, G11 6NX. Corner pub not far from The Three Judges, has a few handpulls on. Locals pub with one bar serving main room. We have visited this pub once, seen 3 different beers and tried 1 of them.